IDAS™ is Icom's digital land mobile radio system using the NXDN™ common air interface. IDAS offers a complete system of handheld radios, mobile radios, repeaters, network interface/trunking controller, remote communicator and various accessories. IDAS is a complete digital solution that system owners and managers can grow into as their own time and budgets allow. Icom America works closely with you to meet your specifications. Get your new project started fast & easy. Learn more about the full capabilities of IDAS 6.25 by visiting our IDAS website. You can also find out about third-party solutions to expand your IDAS system. IDAS has useful calling features including selective calling, status message, radio, stun/kill/revive and GPS position reporting, etc. The IDAS system is ideal for business and industry users who are thinking to migrate to a digital system and hence to future mandated narrow channel spacing. An IDAS conventional IP network can extend your communication coverage. It lets you connect dispersed sites and allows you to communicate like a single site. With an IDAS conventional IP network system, it is possible to have radio communications all the way from the basement to the top floor, all in stable digital audio. Already deployed LAN cables can be used in an in-building solution. 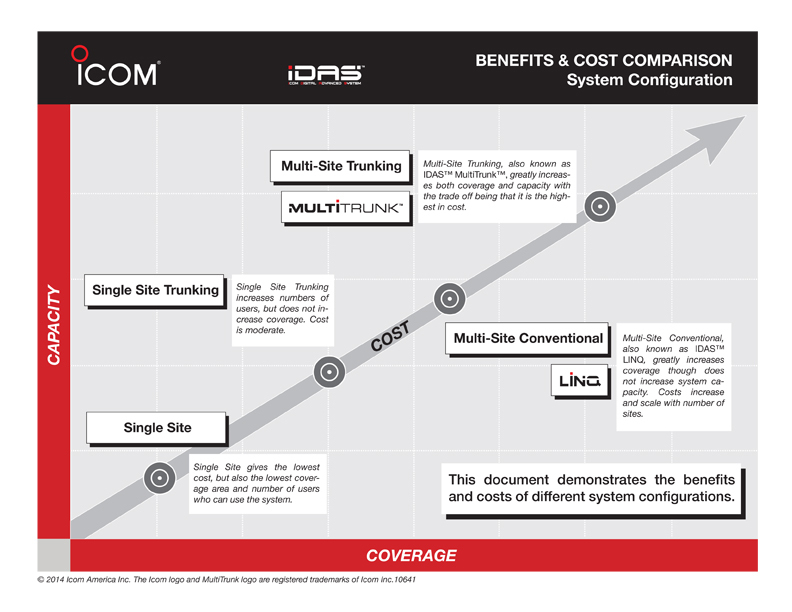 Multi-site conventional systems are possible with IDAS LINQ. Choose from the following configurations: LINQREPEAT, LINQREPEAT+, LINQVOTE, and LINQVOTE+. IDAS MultiTrunk extends Icom's single site trunking system to multiple sites. Although IDAS MultiTrunk builds on the technology of IDAS Multi-site Conventional, it is a huge leap in capability. With IDAS MultiTrunk the advantages of trunking are enabled across many sites separated by great distances for operations that are large and geographically dispersed. The IDAS radio can receive both analog mode and digital mode signals on a single channel. You can partially introduce the IDAS radios, while using the existing analog radios in a system. The IDAS system allows you to scale migration to narrow band digital at your own pace and need, while running your existing analog system. It is a cost efficient way to obtain the next generation two-way radio technology and protect your current system investment. When compared to a TDMA (Time Division Multiple Access) 6.25 equivalent system, the FDMA (Frequency Division Multiple Access) enables "peer to peer" communication between radios in 6.25kHz digital mode. It ensues communication with no reduction in channel capacity, even if a repeater site is not available, or goes down. As explained, the IDAS system allows you to meet US FCC narrow banding requirements, and provides a solution to overcrowded airwaves. When comparing digital with analog FM, the audio quality of analog FM gradually deteriorates with static noise as the distance increases. On the other hand, the digital audio provides noise-less, stable audio for longer until the fringes of the communication range. When secure communication is required, the IDAS system provides a digital voice scrambler using a 15-bit key (about 32,000 keys) for encryption as standard. This is added security to the digital modulation/demodulation. The IDAS system allows you to call individual or group users. IDAS radios automatically send their own ID number when the PTT button is held down. IDAS radios memorize up to 500 of both individual/group ID is displayed on the LCD while receiving a message allowing you to identify who is calling. When the talk back function is enabled, the IDAS radio automatically selects the received talkgroup or individual ID to reply to the received call, while the talk back timer remains. After the talk back timer is exceeded, the IDAS radios will set to an initial call mode depending on programming which is either talkgroup or individual call or retain the previous user call mode selection. When secure communication is required, the IDAS system provides a digital voice scrambler using a 15-bit key (about 32,000 codes) as standard. This is added security to the digital modulation/demodulation. When the emergency button is pushed, the emergency signal will be automatically sent to the dispatcher or another radio. Other emergency features are a man down feature and a lone worker function, available for automated emergency calls (in digital and analog modes). A remote radio monitor function allows the dispatcher to turn on the PTT button from a remote location and transmit anything the microphone hears for a preprogrammed time period. You can set up to 100 conditions such as "on duty," "at lunch" or "in route" and send your status to another unit or the dispatch. Also, you can request another unit to send their status and receive it. When used with the GPS speaker microphone, HM-170GP, for the handheld radio or an external GPS receiver for the mobile radio, the IDAS radio can send the current position information to another unit or the dispatch. Simultaneous status message and GPS data can also be sent. When connected to a PC installed with a mapping software application, the dispatcher will know the real-time activity of the fleet members. The radio kill functions disable a lost or stolen radio over the air, eliminating security threats from undesired listeners. When the radio receives the stun command, all functions will be locked out until the revive command is received or the user password is entered. The IDAS radio can also send radio stun, kill and revive commands. The RAN code is the digital equivalent of CTCSS for accessing an IDAS repeater or digital code squelch function. Short data messages of up to 12 characters may be sent and received between IDAS radios or from the remote communicator. With the optional UC-FR5000, up to 16 IDAS repeaters can be interlinked with each other. An IDAS terminal radio user can communicate with other IDAS terminal radio users belonging to the interlinked repeater sites and/or a virtual dispatch station on the network. By using the AMBE+2™ vocoder compression, an IDAS conventional IP network requires only about 13kbps bandwidth per one voice path in theory. It means a DSL class line is sufficient for the IDAS conventional IP network. The IDAS conventional IP network. The IDAS conventional network system requires only one fixed IP address in a group of networked repeaters. Other repeater sites can work with dynamically allocated IP addresses when the IP manager/client mode is enabled through some restrictions may still be applicable. Icom has made it simple and easy to introduce and install an IDAS conventional IP network system requires only the UC-FR5000 network controller which can be installed into the IC-FR5000 series repeater - no control server and no extra rack space is required. In addition, the repeater and network controller settings can be remotely maintained and monitored over an IP connected PC. *The RC-FS10 software can transmit one voice path at a time. One CT-24 is required for receiving an IDAS repeater site and up to 8 repeater sites can be monitored simultaneously with 8 CT-24s. Late entry: IDAS radio can decode the received ID and show group ID, unit ID or alias name on the display even when turned on during a conversation.